The Obvious Co.-backed company Lift has announced plans to launch an iPhone app that is a ‘simple, positive way to achieve any goal. The app, which is designed to help people achieve ‘any goal’ will be released in August. Back in August of last year Obvious Co. partners Biz Stone, Evan Williams and Jason Goldman, announced its first project. It was called Lift and it’s a partnership with developers Tony Stubblebine of Crowdvine, Jon Crosby of Path and designer Connor Montgomery. Lift says that it wants to ‘eliminate willpower’ as a factor in achieving goals but providing smooth self-reinforcing paths for any of your aspirations. Lift will track your habits and your incremental progress towards various goals that you set for yourself. 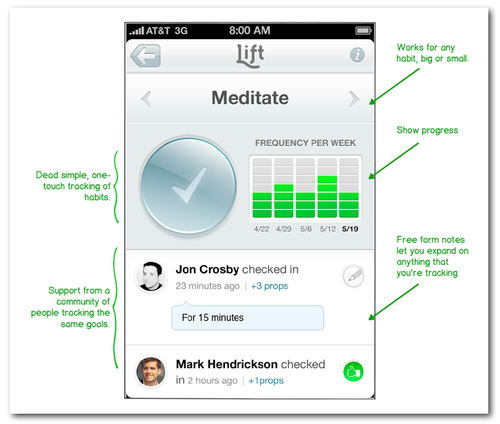 Lift says that it applied ‘decades of psychology research’ in simple ways in order to build the app. The app will be out in August, and we’ll be tracking it, as it sounds like an interesting cross between a to-do list and a check-in app like Foursquare.